Forums » Professional Video Editing & Finishing Forums » Film and 24p » 23.98 footage does not match edit rate of 23.976 sequence? Latest post Sun, Aug 3 2014 12:07 PM by jdwyer. 4 replies. Apologies if this is the wrong forum for this question; I figured since it was a 24p-related question it might have the best chance of getting solved here. 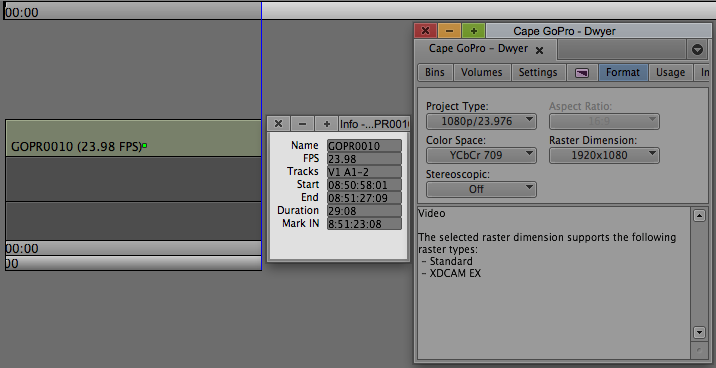 Only reason I'd like to render/transcode is to allow for smoother playback in the preview monitor and in the sequence. If I could do the whole thing in AMA and know for certain that when exporting that the ghosting wouldn't occur, then I would. TL;DR — Avid sequence not recognizing 23.98 footage as 23.976 and forces me to render or transcode clip, resulting in strange jittering/ghosting. Wondering if I'm missing a step or setting, or if this is just what happens with GoPro/23.98 footage in a 23.976 sequence. Thanks for y'alls help in advance. This is a hugely frustrating thing that I'm guessing probably has a simple solution. Looking forward to y'alls replies and suggestions. 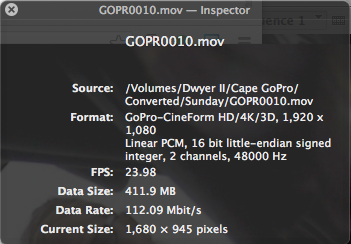 Re: 23.98 footage does not match edit rate of 23.976 sequence? Joe, did you ever find a solution to your problem? I'm having the same issue, trying to transcode both MOVs and MP4s that are 23.98, but Avid wants to convert them because of different "edit rates". I have seen odd QT framerates sometimes, both in QT and in MC. Use at your own risk, features like this that can only be activated through the console are untested, and not fully supported. P.S. : This feature does nothing to sound, the sound will remain the same speed and sample rate. Hi Don, apologies for the late reply. The solution that I came to was to use MPEG Streamclip to transcode the original GoPro footage files to DNxHD 145 or 200 (not sure exactly which, sorry. The project is on a old hard drive I can't access right now) For some reason transcoding the files through MPEG Streamclip gave me useable 23.976fps clips without the jitters or ghosting that Avid was giving me. I've since upgraded to the new GoPro 3+, but have not shot anything yet to edit with. Am currently working on a project where I'm using it, but it will be a few months before I get to post to see if Avid plays any nicer with the new camera 24p files. The command line solution above is intriguing, and if you're like me and like to stay within Avid instead of whipping out 3rd party programs to transcode footage and possibly lose quality, I'd give it a shot. If you do, let us know how it goes.